Manifest Destiny – that ol’ American concept of space as entitlement – becomes a wide, open reality west of the Rockies. From Utah’s Bryce Canyon down to the border towns of Mexico; between the Mojave Desert and the Navajo Reservation; beyond Santa Fe but before the resorts of California’s Palm Springs; this corner of America still encourages the brave and curious to Go West! 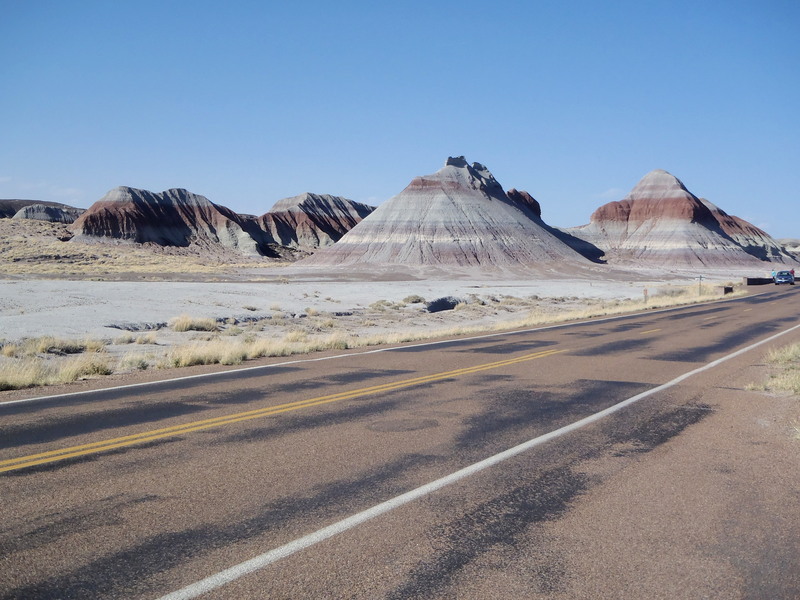 20-some miles from Holbrook, Arizona, old Route 66 disappears into the pastel sands of the Painted Desert. Barely visible from the highway, a bronzed sculpture gives tribute to America’s original, old fashioned road trip. Rolling ever towards the coast, towards water, your tires claim tracks that appear to be history’s first. Lonely trading posts advertise native jewelry. Rusty trailers melt into sandy front yards. Billboards announce famous and unfamiliar rock formations, cheap saloons and “authentic” Mexican restaurants. Like those stoic Saguaro cacti, you’ll need thick skin, patience, and a willingness to seek beauty beyond a cracked exterior. 1. The Grey Estates – Wolf Parade: The road trip doesn’t start until you decide to leave. “Darling please, let’s get out of here/ On a train to who-knows-where/I’ve got a feeling that I can’t explain/ We have to leave this place, we won’t be back again…” Grey estates disappear in the rearview mirror, burning out as the asphalt expands horizontally. 2. Diafrix ft. Daniel Merriweather – Simple Man: While Vegas and Phoenix might dazzle with eternal electricity and ethnic cuisine, this isn’t a luxury holiday; it’s three weeks without easy access to shampoo or lattes. It’s brushing your teeth in Walmart and borrowing condiment packets from the gas station. The desert reduces us to sweaty basics. Diafrix is right: who needs money or a dental plan? Simplicity is the lightest baggage. 4. Best Coast – The Only Place: Passing from highway exit to entrance, the epic mountains of Zion or the startling shores of Lake Powell, you’re given a repeated opportunity to ask: “Why would you live anywhere else?” An unpremeditated element of any roadtrip is recognizing those previously unknown locations we could call home. 5. Stornoway – We Are the Battery Human: Originally written as a mockery of the London office lifestyle, the lulling vocalizations of Stornoway mix perfectly with an early morning departure into the Great Outdoors. The Southwest changes so frequently and suddenly – scenery and biology and humanity – it invites us to be the “free range” people Stornoway lament. 6. Vagabond – Wolfmother: One of my absolute favorites, a must on any travel playlist. “You don’t know need to know what I do all day/ it’s as much as I know watch it waste away/ ‘cuz I’ll tell you everything about living free.” Let the folks back home wonder where your monthly wages might come from; to you, the highway beckons…. 9. Noah and the Whale – You Can Call Me Al: Long-distance travel with one piece of luggage is a lesson in self-reflection, measuring dreams and challenges out the window of your vehicle. Paul Simon’s lyrics, plus Noah’s light ukulele strings, should give you something to think about. Why are you soft in the middle? Where’s your photo opportunity? What can we call you? 10. Those Dancing Days – Those Dancing Days: Once you’ve finished cleansing your conscious, Those Dancing Days offers a more optimistic song for the summer roadie. “High on life, in love with me/ dancing through the night, dancing through the day…” Time does not exist, but the season will run out, so grab those final hours of evening and exude them in any way possible. 11. The Beach Boys – Beaches in Mind: In the final song on this Volume One playlist, those old school surfer songwriters coach you on to the ocean. “We got beaches in mind/ man, it’s been too much time….” Wherever you are in the region, this should remind you to keep moving West, continue crossing those pock-marked mountains and train your eyes on the distance. An oasis lies over that ridge; a frosty beer and a reminder that life has never been this good.